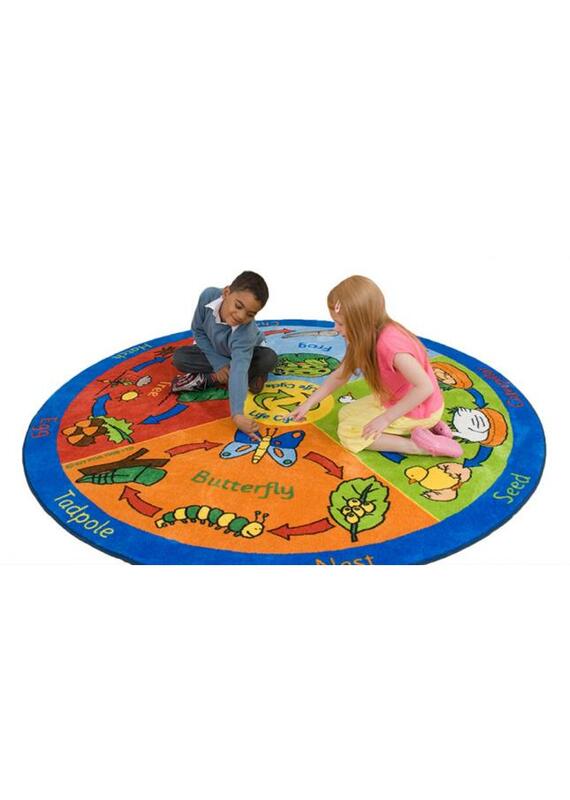 The Back to Nature Life Cycle educational rug is perfect for early years’ classrooms as it creates an excellent and fun starting point for group discussions, interactive learning and games. The circular shaped rug features colourful and clear graphics which explains different examples of typical life cycles including birds, frogs, trees and butterflies. Designed with comfort in mind, the extra thick classroom carpet is manufactured using a premium heavy duty tuf-pile with an extra thick, soft textured Nylon finish. It features a specially designed anti-slip Rhombus backing to ensure safe use on all surfaces and conforms to the relevant safety standards EN71 Parts 1, 2 and 3. The Back to Nature life cycle classroom mats are crease and stain resistant. The tightly bound edges prevent fraying for improved durability.